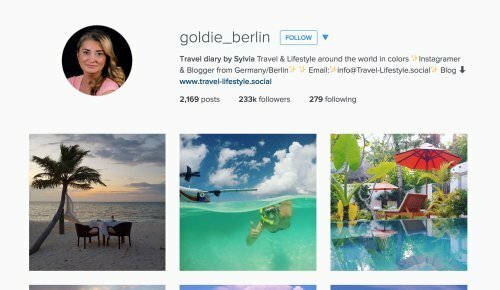 Instagram has quickly become the favorite social network for travel lovers and very recently for us. We were late to join, focussing heavily on Facebook instead, but now see the true value it brings. Like any large social network, you need to cut through the noise to find the best quality content – and believe me, there’s a lot of terrible photos on there too. 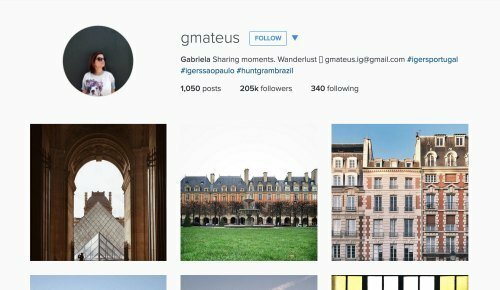 So, we scoured through thousands of profiles and searched a multitude of hashtags, to bring you the Top 50 Travel Instagrammers that you should be following. 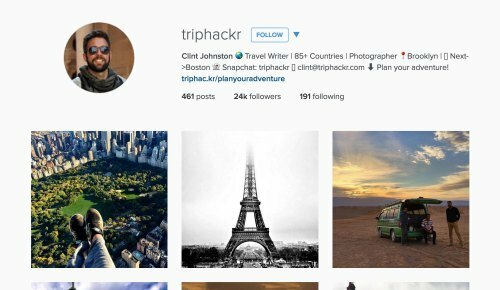 Of course, we’d like to think our Instagram profile is up there too so be sure to follow us at @getbackpacking if you’re not already. 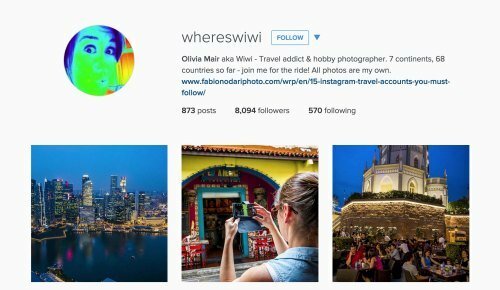 Without further adieu, here are our Top 50 Travel Instagrammers of 2015. 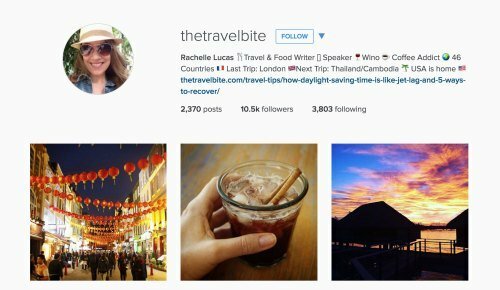 Rachelle is the founder of The Travel Bite, a food and travel blog. As you can imagine, food features heavily in her Instagram feed. 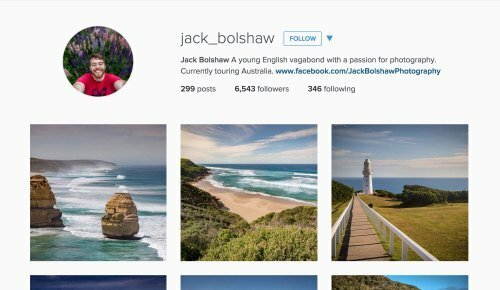 Jack is an English photographer who is currently traveling through Australia. Susan’s photos have appeared in The Huffington Post, New York Times and many other large publications. She is also a full-time contributor to Yahoo! Travel. 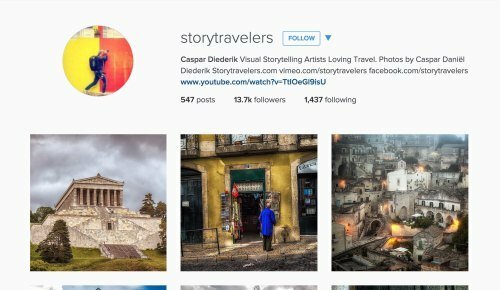 Caspar is the cofounder of Story Travelers, a site dedicated to creating stories through travel photography. 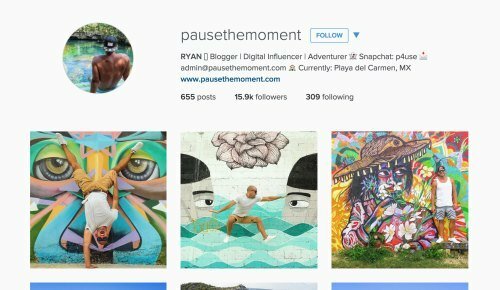 Ryan is a travel blogger who has been on the road since 2010. You can read more about his adventures on his blog, Pause the Moment. 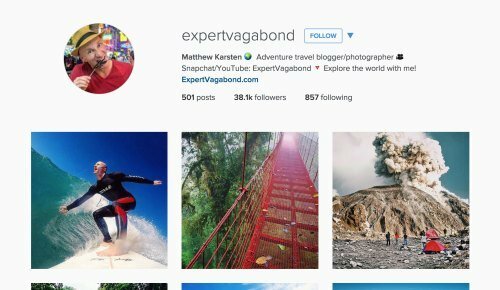 Clint is a travel blogger and photographer from Boston. We like his ‘feet-first’ perspective. 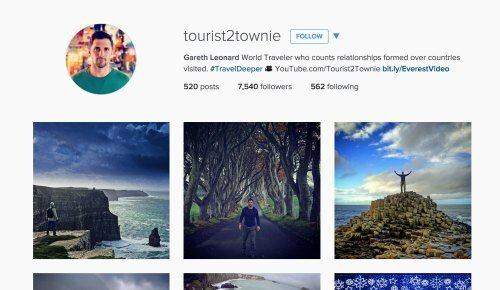 Gareth is the blogger behind Tourist 2 Townie who left his high-paying job to travel the world. Dave and Lina have been traveling since 2001. 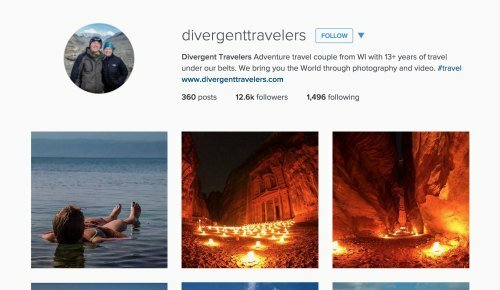 Their journeys are documented through their blog Divergent Travelers. Olivia (aka Wiwi) caught our eye with her use of vibrant colors. She’s also visited all 7 continents. 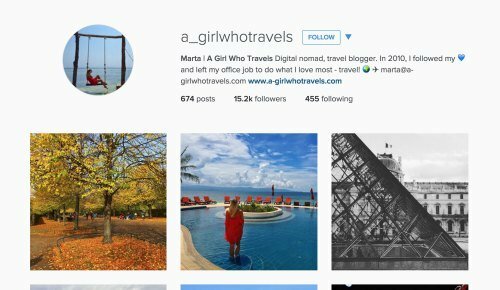 Marta is the digital nomad behind A Girl Who Travels. She’s been living the life of travel since 2010. 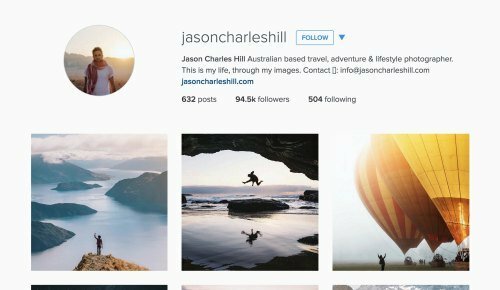 Jason is an Aussie traveler and photographer with a primary focus on the great outdoors. Adam is a pilot who also happens to be an amazing photographer. If you like planes, you’ll like Adam’s page. Marta is the face of the blog In a Far Away Land. We’ve featured her photos previous so she’s obviously awesome. 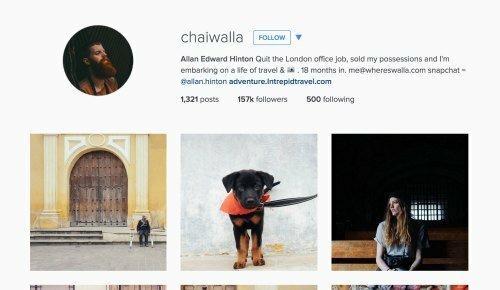 Allan is another guy who quit his job to travel the world… there’s a theme here. He also takes great pics. 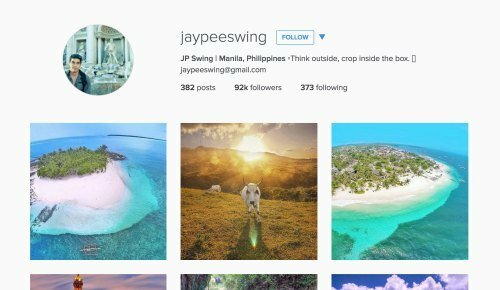 JP’s photo’s make you want to pack your bags and book a flight to the Philippines right away. Take one look at Tiffany’s photography and you’ll get lost for hours. Landscapes, waterfalls, and nature abound. 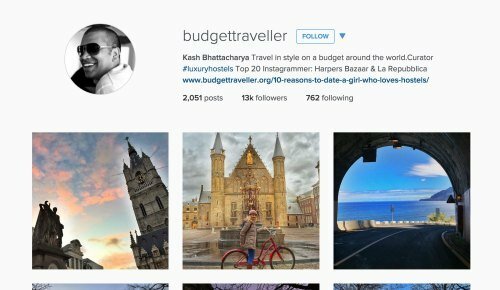 Kash is the man behind Budget Traveller, a blog for discovering luxury hostels, some of which feature on his Instagram. 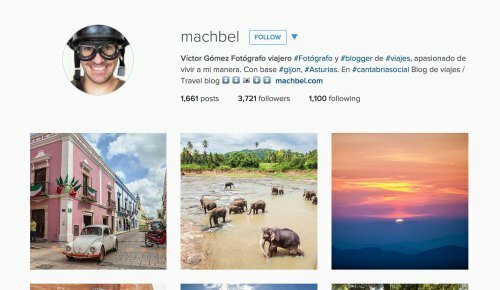 Daniel and his wife Audrey are well-known among travel bloggers. Daniel’s photos invite you into their life on the road. 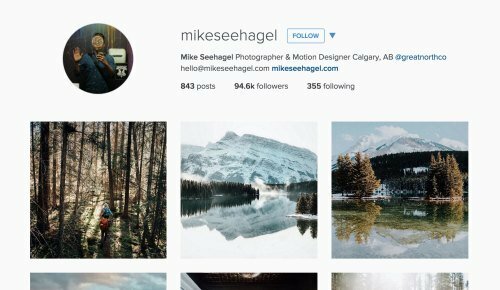 Mike’s photography captures the essence of the outdoor life. We love his use of light. A mix of travel and art. Gabriela takes you on a journey with her wonderful photos. Johan set off from Belgium in 2013 and hasn’t looked back. 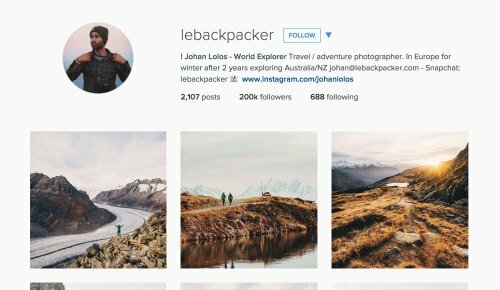 After making his way to New Zealand, he landed a gig with Lake Wanaka Tourism. Shane caught our eye with some of his night photography. If you like the Milky Way, check him out. We met Trey a couple of years ago while he was shooting at Burning Man. A nice guy and truly amazing photographer. Matthew (aka the Expert Vagabond) lives an action-packed life even James Bond would envy. Definitely worth following along. 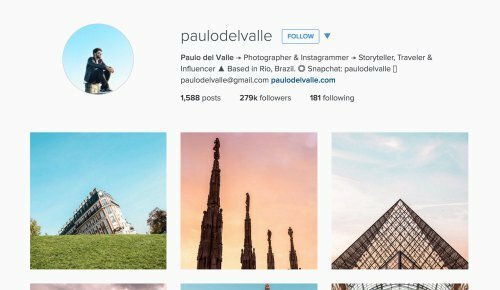 Paulo calls himself a professional Instagrammer, and we can see why. With over 200k followers, doors are certainly opening for his career. Oleg is not your typical Instagrammer. 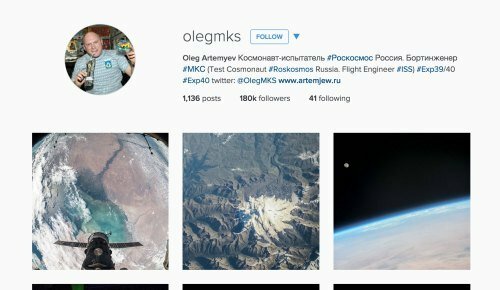 He is a Russian cosmonaut so his photos are unlike any other – taken from space. Hailing from Berlin, Sylvia has been tearing up Instagram for the last 4 years, growing her following to over 200k. 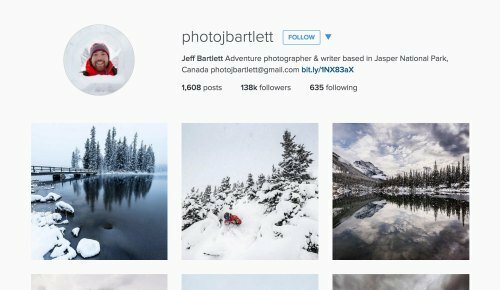 Jeff is a Canadian adventure photographer who shares his passion for adventure and the outdoors through his images. 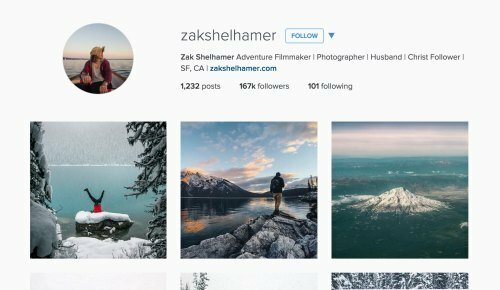 Zak has been ranked among the top Instagrammers by the likes of Forbes, Huffington Post and Lifestyle Mirror. 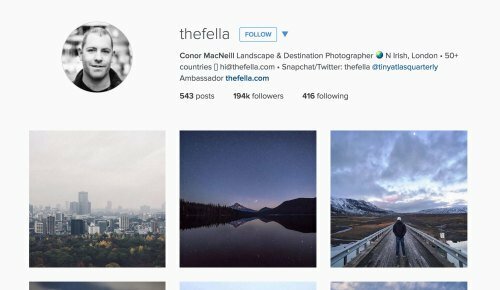 Conor is a travel and destination photographer from Belfast who has traveled to over 50 countries amassing a stellar portfolio. These guys need no introduction. 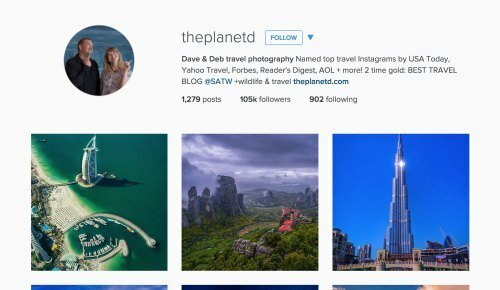 Dave & Deb are constantly topping lists for travel blogging and photography. Víctor is a relatively undiscovered travel photographer based in Gijon, Spain. While not as famous, his photos are up there with the best. 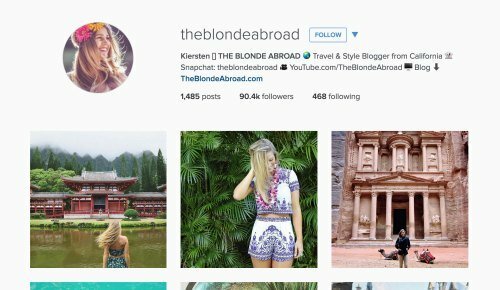 Not just a pretty face, Kierstan from the Blonde Abroad, has made a name for herself by capturing the fun of her travel lifestyle. 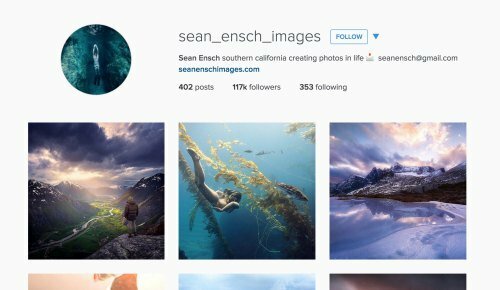 Sean is a travel photographer with a focus on landscapes and underwater photography. An avid freediver, he feels at home beneath the surface. 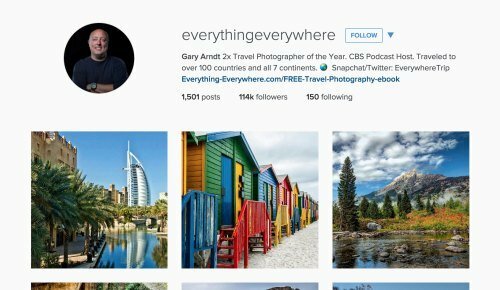 Since setting off in 2007, Gary has visited over 170 countries and territories and been named Travel Photographer of the year! 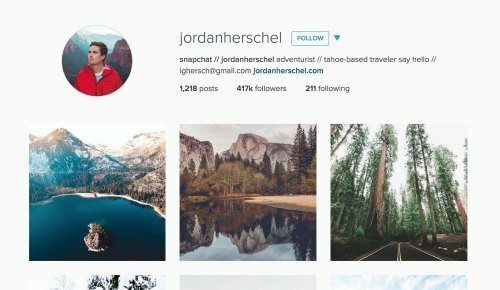 Jordan is somewhat of an Instagram celebrity, royalty you might even say. No wonder though when you see his photos. Another National Geographic Photographer, they really pump them out don’t they. 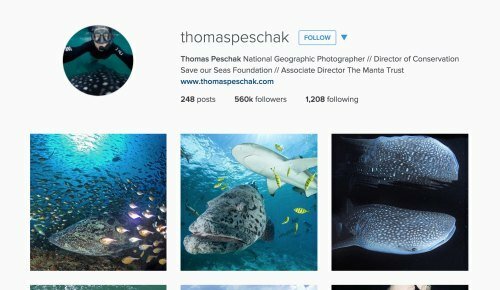 Thomas’ photos will transport you to a life in the sea. 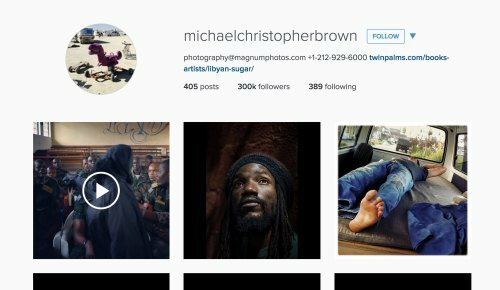 While not strictly a travel photographer, Michael’s photo journalism provides a glimpse into the people of the world. 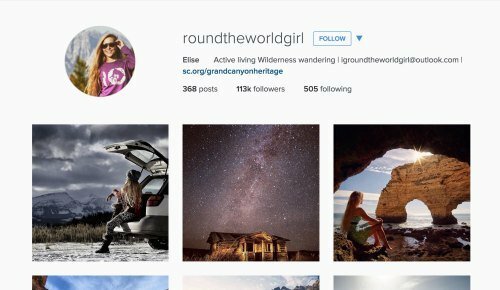 Take a look through Elise’s Instagram feed and you’ll think you’ve landed in a North Face ad. 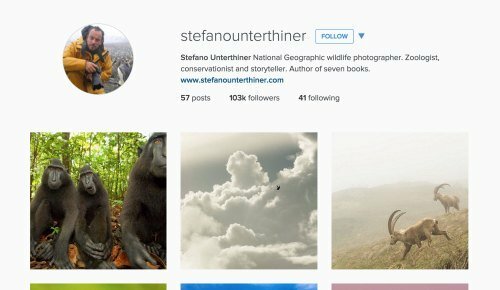 Stefano is a National Geographic wildlife photographer with a keen interest in wildlife conservation. No zoo required! Brooke Saward is an Australian travel blogger who has risen to stardom in the last 3 years. 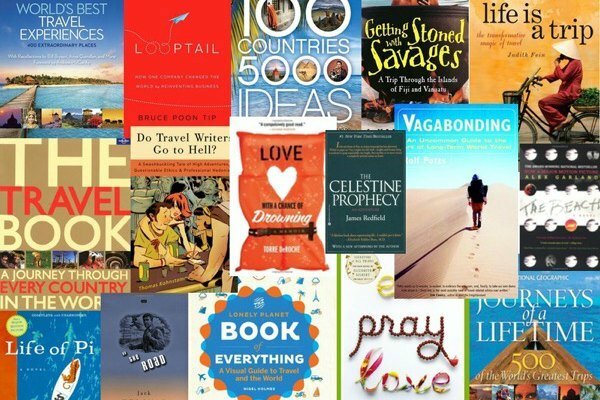 Her blog ,World of Wanderlust, now has over 4 million visits and 500k + social fans. It’s clear that exceptional photography has played a large role in the growth. We came across Ken almost a year ago and have mesmerized by his photos ever since. 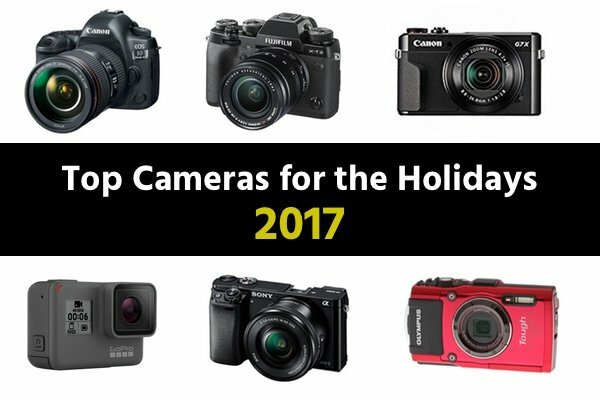 This year, Ken co-founded Dream Photo Tours offering photograph-centric tours in Cambodia, Jordan, Myanmar, Iceland, Japan, Namibia, Vietnam and Italy. Cory Richards is a National Geographic Photographer, film maker and experienced climber. He was named the National Geographic Adventurer of the Year in 2012. 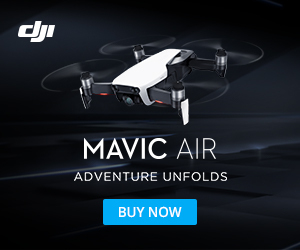 Get ready to be blown away by his captivating feed. Brendan’s reputation has been on the rise of late. His work has allowed him to travel extensively through Southern and Central America capturing the beauty of the locations and people he meets. With nearly 1 million followers, Cole must be doing something right! You better believe it. 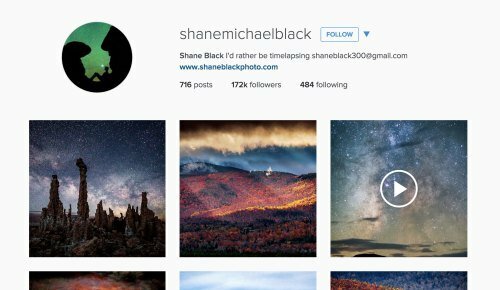 Not only are his photography skills are rock-solid but he has a way with story telling through his images. A worthy additional to the top of this list. Liz makes us want to get out there and start exploring. She is a master of composition and knows exactly how to draw your eye into the scene. 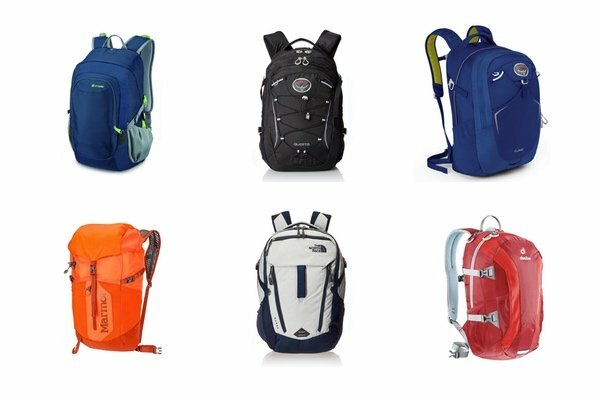 Couple that with her thirst for adventure and you’ve got a winning combination. 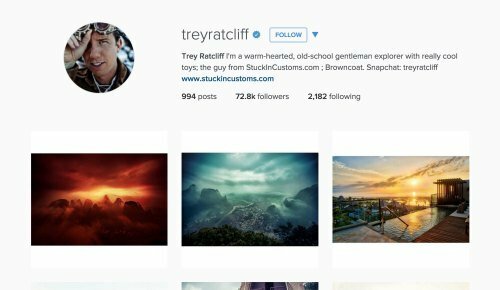 Another guy on the verge of breaking into the million follower club is Alex Strohl. 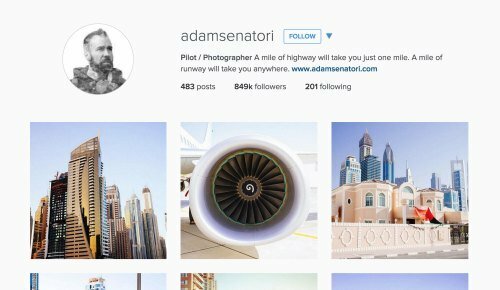 This French photographer has been featured in Forbes and counts Apple, Google, Facebook and Canon among his clients. Needless to say his photos are unreal! Oliver is a talented photographer from Barcelona, Spain. At the age of 17 he began traveling and has carved a nice niche with his unique view on the world. We just can’t get enough of his stunning photography. Lauren went from being a chef to Instagram fame. 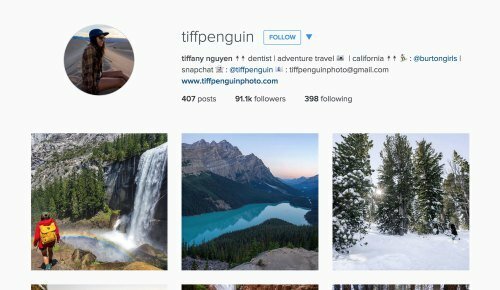 With nearly half a million followers she has turned her social fame into a flourishing photography career and Australia’s first professional Instragrammer. Welcome to the millionaire club. Chris Burkard is renowned surf photographer who is constantly seeking remote (mostly frozen) destinations to shoot. Chris has spoken for TED and worked with the world’s top brands, yet it is his passion for adventure and the unknown, coupled with his incredible photography skills that puts him on the top of our list. A BIG congratulations goes out to everyone who made this list. You not only caught our eye but our imagination too. You inspire us to keep seeking the path less-traveled! 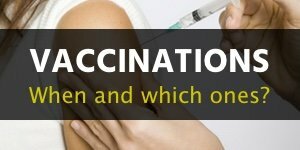 It took many hours of research to compile this list and our opinions are purely that. Of course, we’d love to discover more people like those featured above so if we’ve missed one of your favorites, post it in the comment section below. Be sure to follow us on Instagram too as we post the best images from our backpacking community. If you’d like to be featured, you can upload your best photos in our fan photo section. We post a new pic every day! 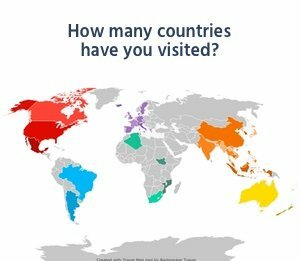 Selected photos are posted on this site backpackertravel.org, our Facebook, Twitter, Pinterest and Instagram. Full accreditation is provided. Thanks for choosing me for the list! A great honour to be amongst such amazing photographers and a few of my good friends as well! You’re welcome! There’s certainly a bunch of talent on this page. Glad you are happy with how it turned out. What a list! So much inspiration! My account @the_wanderinglens focuses on seeing the world from the water and beautiful places for photographers to capture their adventures! Love this post because I have the opportunity to see new amazing account! If u want, this is my IG account @EziomrLifestyle Pic about Lifestyle, travel and Italy! Great list! 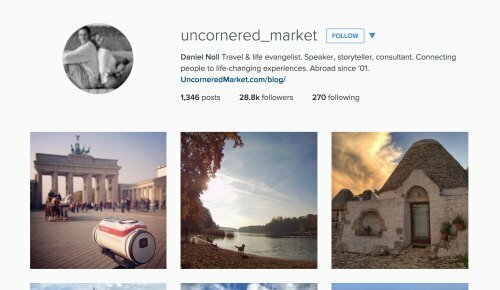 Feel free to check out my travel-inspired IG account, too – @dangerousbiz! 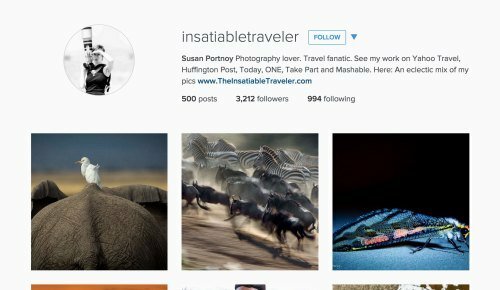 Honored to be included in this list of spectacular Instagram accounts!! 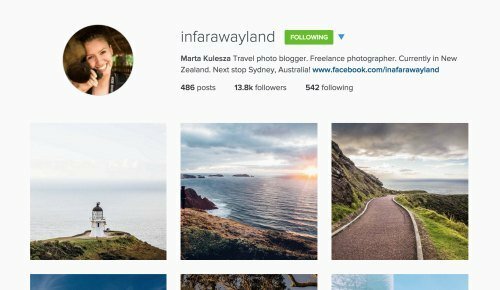 Lots of wanderlust going around from these accounts. Thanks again for the inclusion.